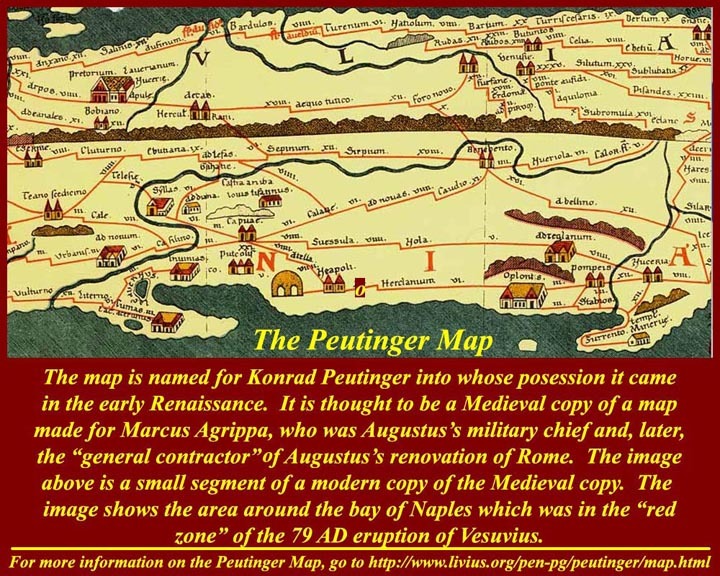 The map shows the places, highlighted in yellow, that are covered in this unit. 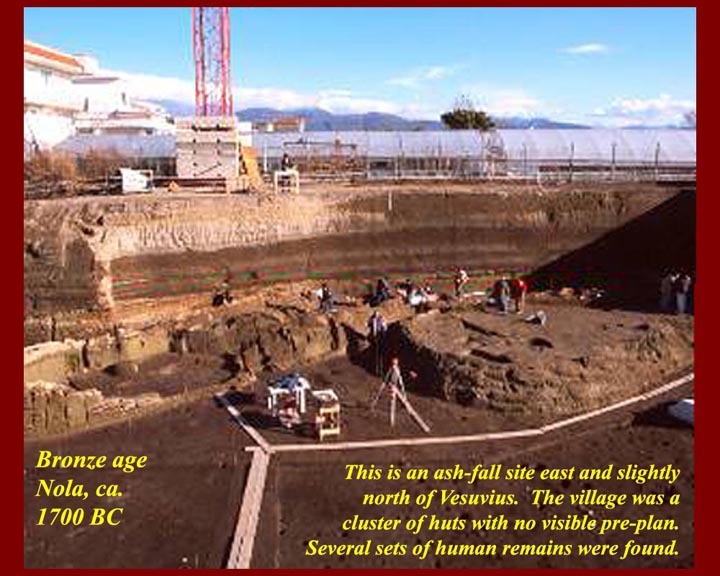 The bronze age village at Nola was discovered under a thick layer of volcanic ash (from an eruption about 1700 BC) while a building foundation was being excavated. 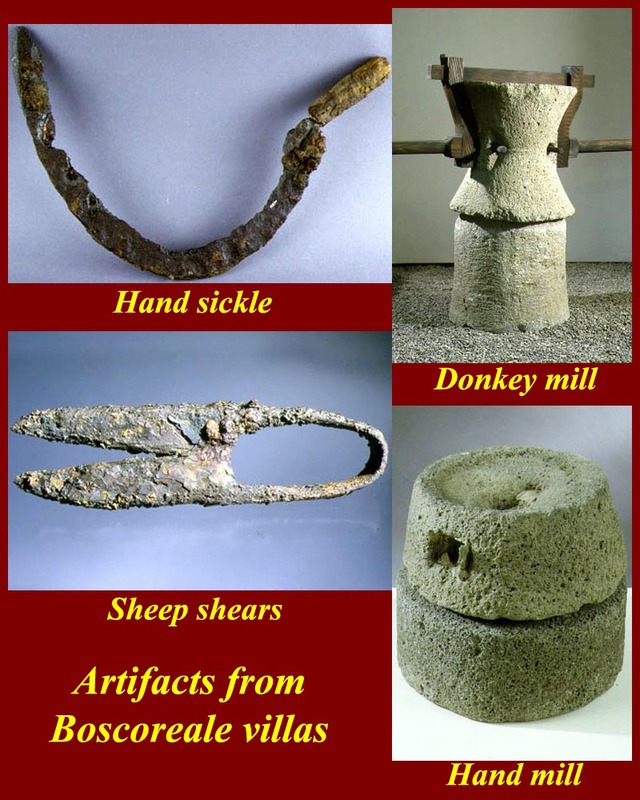 Archeologists had found other ruins from the 1700 BC Eruption, but this was certainly the best: whole buildings were preserved as well as a goat pens, a pottery kiln with a pot still inside, and numerous artifacts. 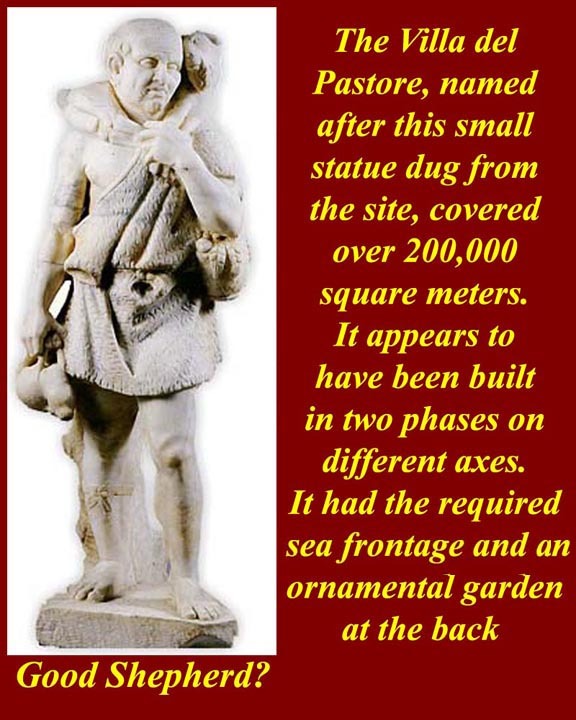 The Nola site is the best preserved bronze age site in Italy. These are two huts -- long houses -- each of which may have housed more than one family or an extended family group. The upper hut is about 24 feel long, and the lower one is about 50 feet long. Each is divided into two rooms, a living area and a storage area (further from the entrance. 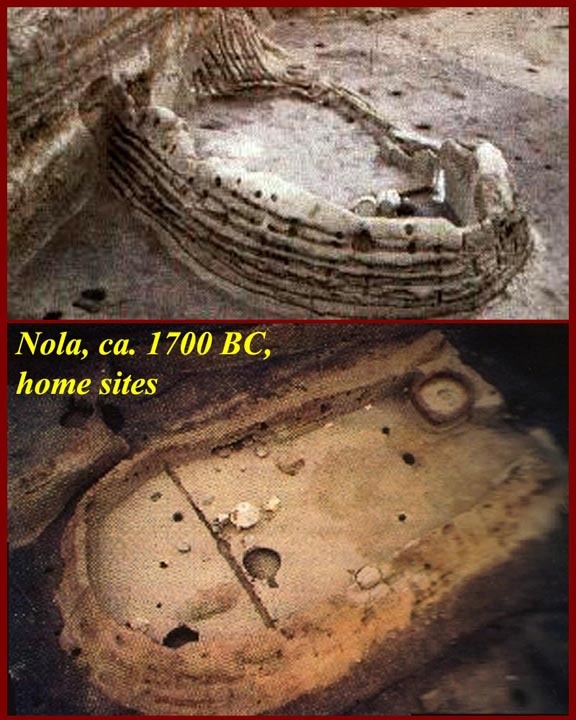 There are additional images of the Nola site at http://anthrocivitas.net/forum/showthread.php?t=5280, and an English language article about the site is at http://www.meridies-nola.org/nola/villaggiopreistoricoing.htm. 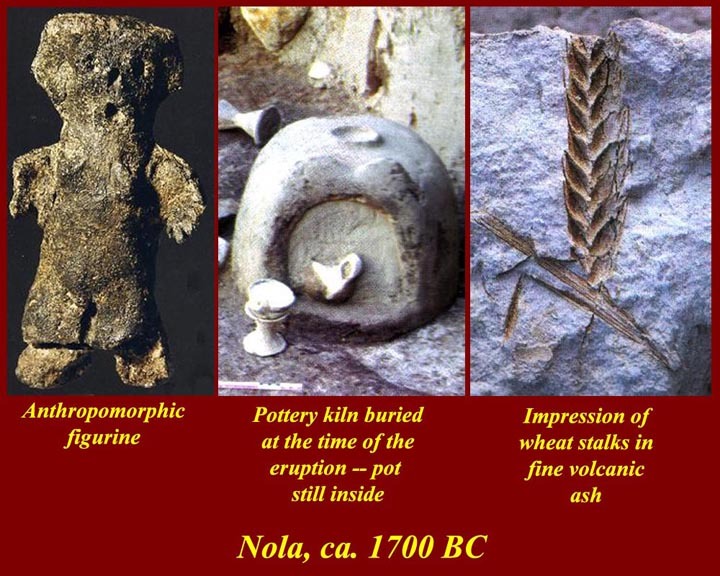 Artifacts and plant material from Nola: Human figure, found at the bronze age level, may actually be older and may have been preserved frome earlier times as a cult object. The pottery kiln, about two feet high and buried during the eruption, still had a pot inside. Stalks of wheat were buried and carbonized. 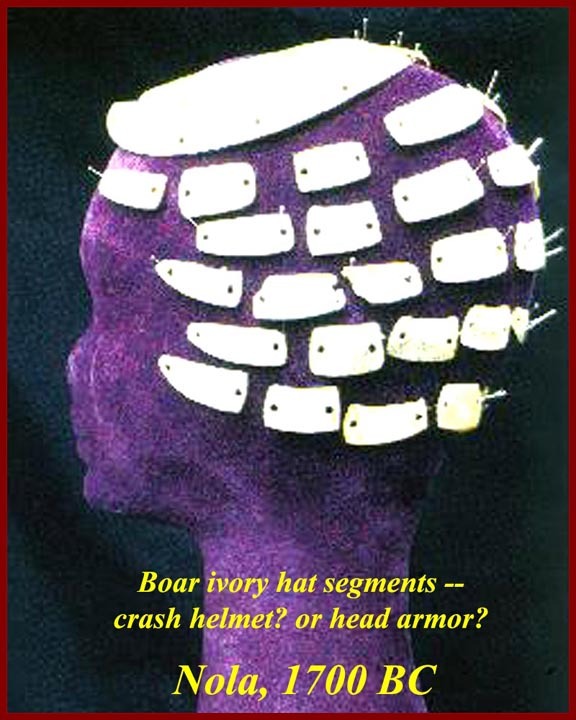 A boars' teeth cap or helmet, reconstructed, from bronze age Nola. It may have been ceremonial or may have been a protective helmet. 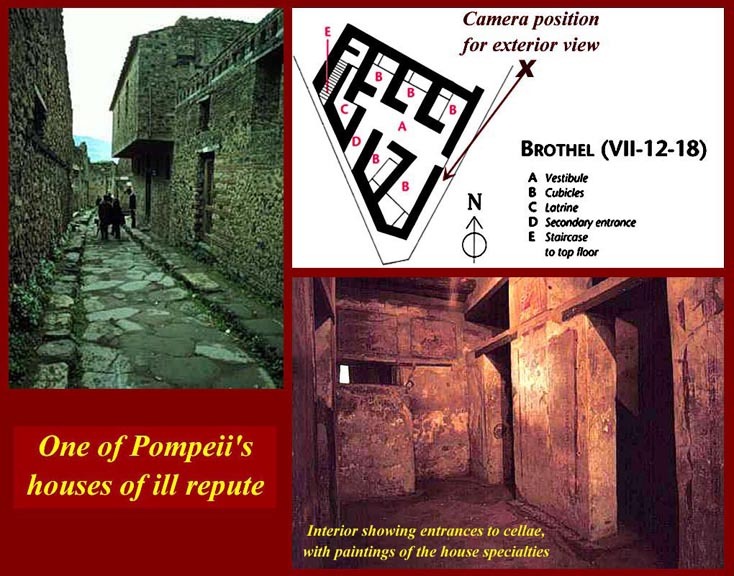 Oplontis: A sumptuous villa that probably belonged to Nero's second wife, Poppea, in modern Torre Annunziata. 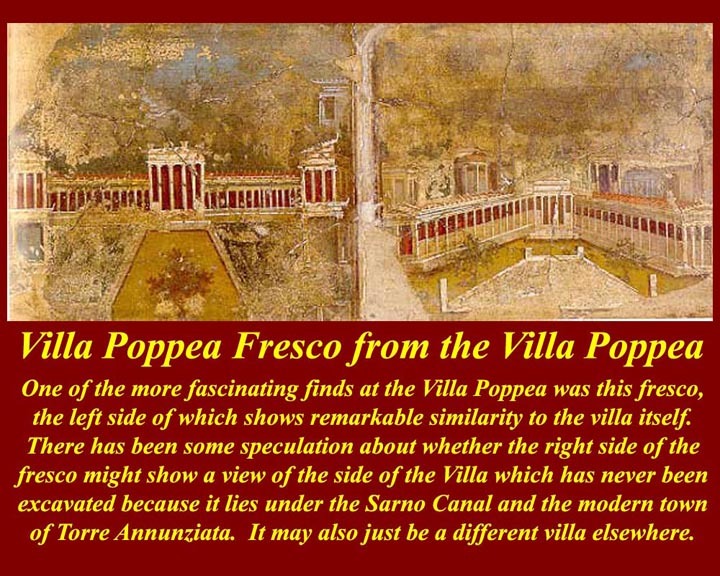 Fresco from inside the villa -- now in the Naples National Archeological Museum -- shows two villas, the left of which looks remarkably like the Villa of Poppea. The other side (front entrance side) is still buried under the Sarno River Canal and the modern city, so there's no way to tell whether it looked like the right side of the image. 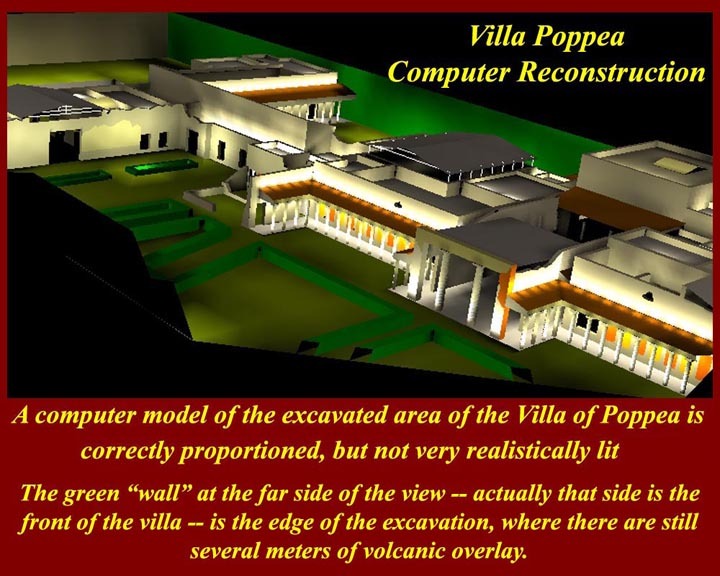 A computer generated view of Poppea's villa. The green wall away from the viewer is the still unexcavated volcanic debris. The lighting is a modern effect that allows viewing of the site at night. At the right side is the debris wall, and above it is the town of Torre Annunziata. 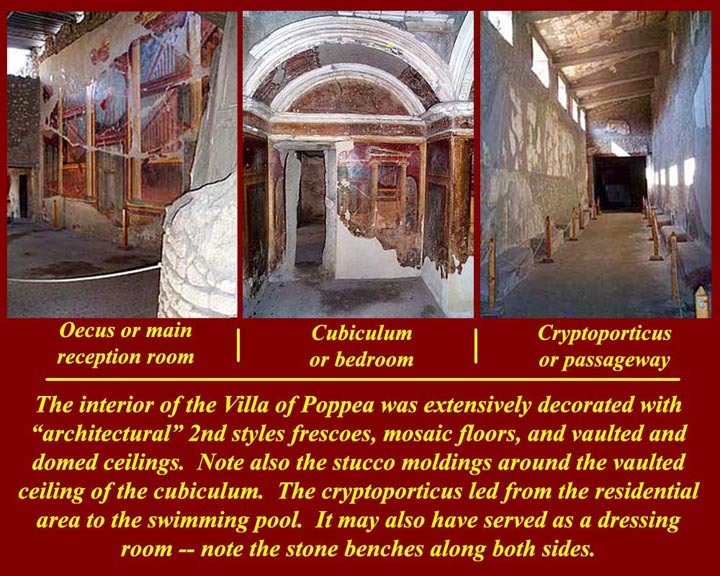 Three views inside the Villa of Poppea: the Oecus or main entertainment space (where large meals could be held, for example), a cubiculum or bedroom (note the stucco decorations around the ceiling), and the cryptoporticus passage between the living quarters and the pool. An external portico with half-fluted columns. A perisyle courtyard. 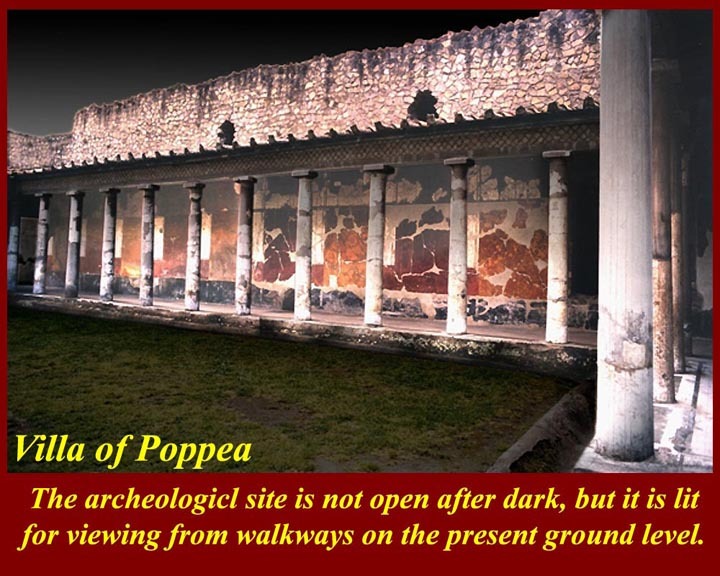 The archeological site is not open after dark, but it is lit for viewing from the walkways above, at ground level. 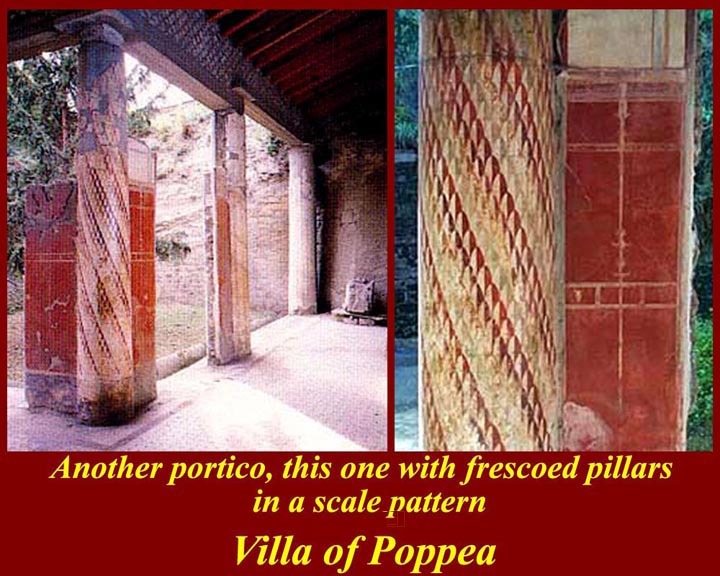 Another Villa Poppea peristyle, this one with stuccoed columns in a feather pattern. 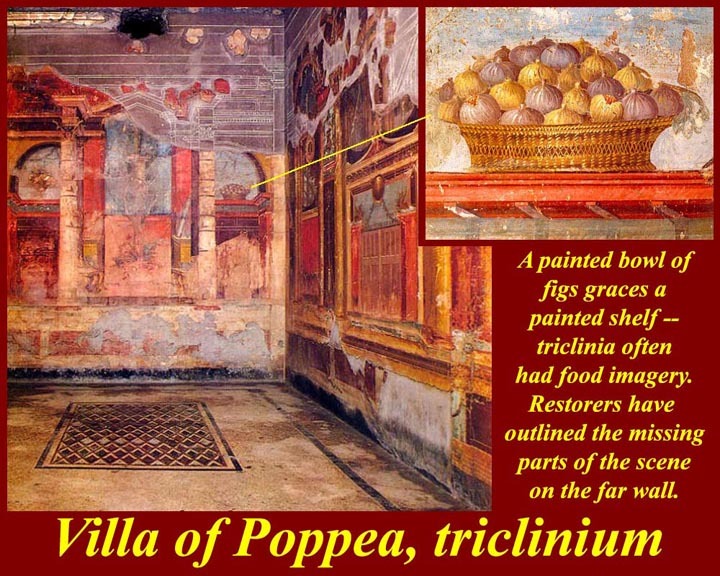 In triclinia dining rooms, food was often part of the decorations: here, a painted basket of fruit on a painted shelf. 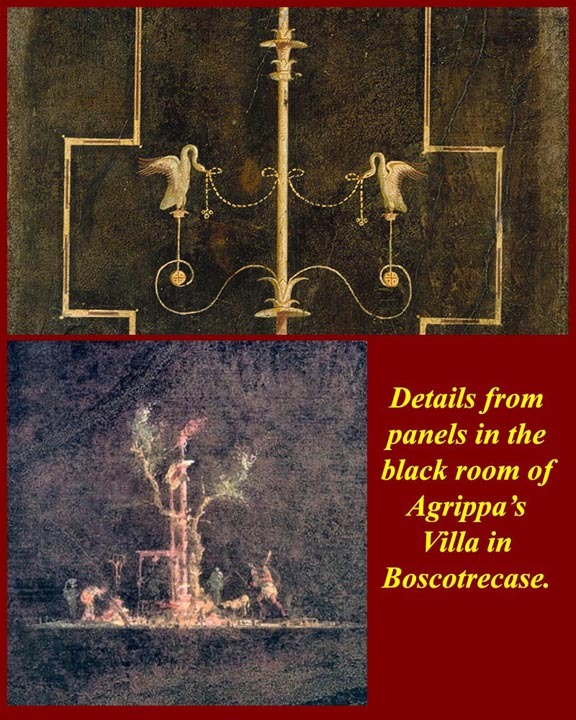 Restorers have inscribed the upper wall to complete the architectural pattern of the fresco. 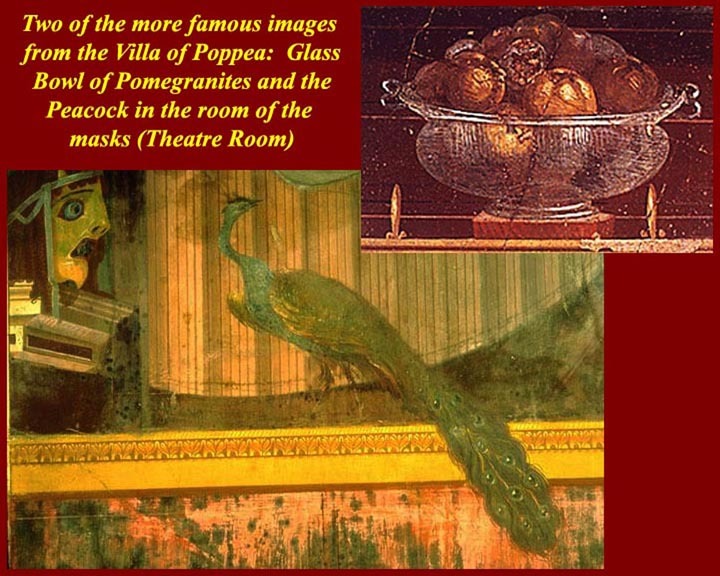 Two of the Villa's more famous artworks: pomegranates in a glass bowl, and a peacock on the wall. Architectural second style decoration is often described as "theatrical". 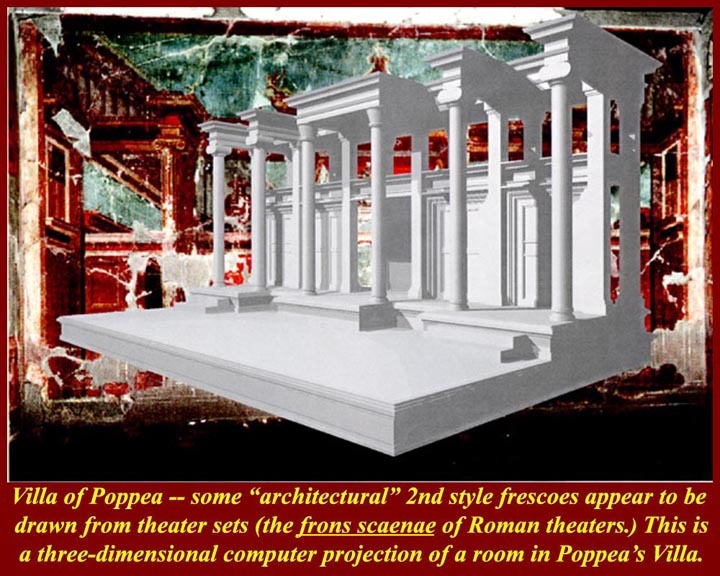 Here, modern archeologist-architects have lifted the "set" from the wall in a three dimensional projection. 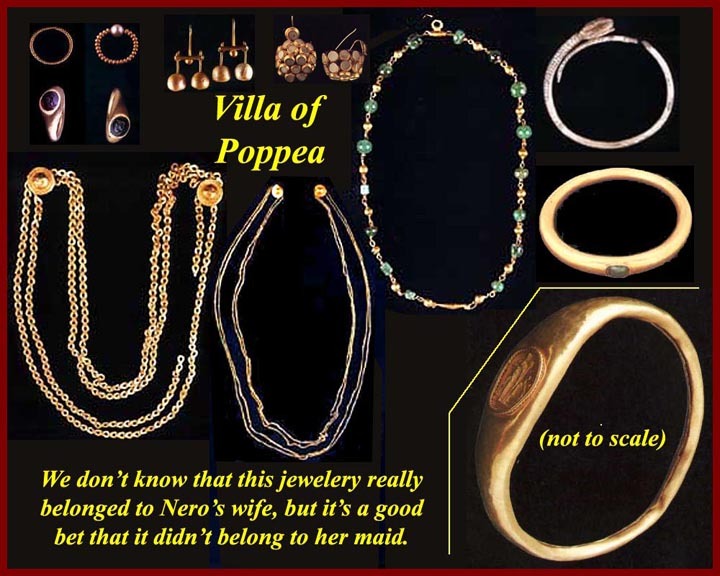 Villa Poppea jewelry: (clockwise from upper left) rings, two sets of earrings, an emerald necklace, three bracelets, and two belts -- all in gold. 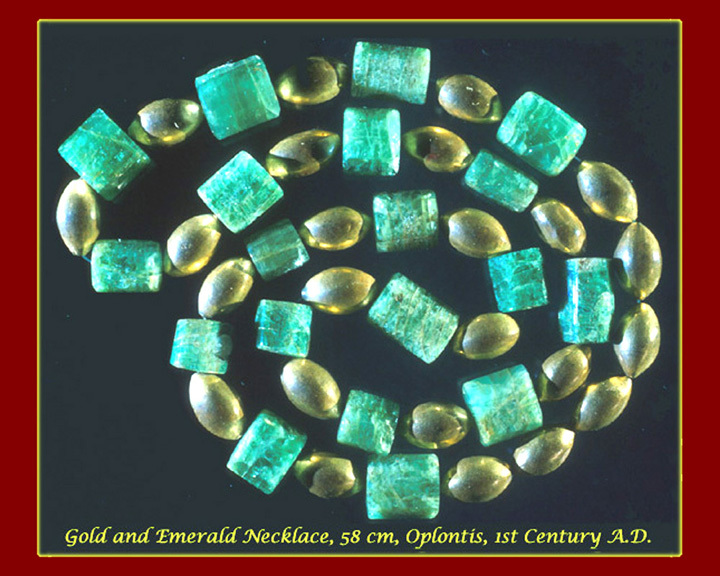 A gold and emerald neckace found with the body of an eruption victim in "Villa B" in Oplontis -- go to http://www.smatch-international.org/Fascinating.htm for information on emeralds from SMATCH. 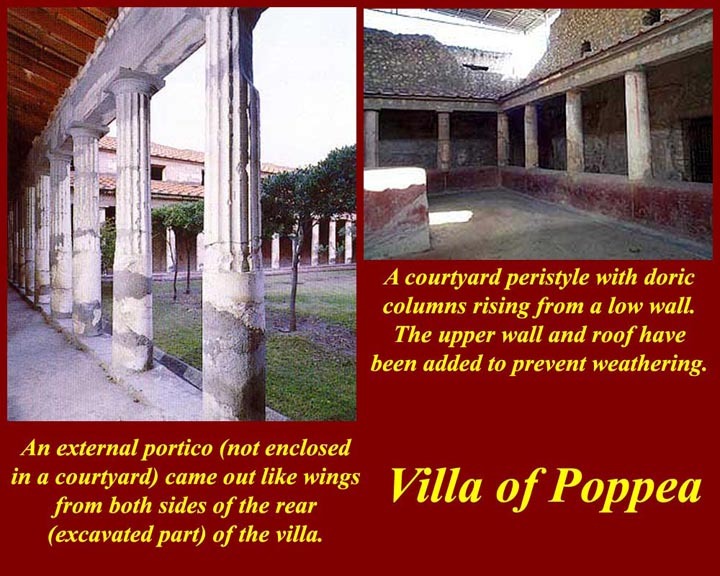 Villa B at Oplontis was not as big as Villa A (Poppea), but it had good architectural features like this long two level peristyle courtyard. Discovered in 1974, it is still not open to the public. 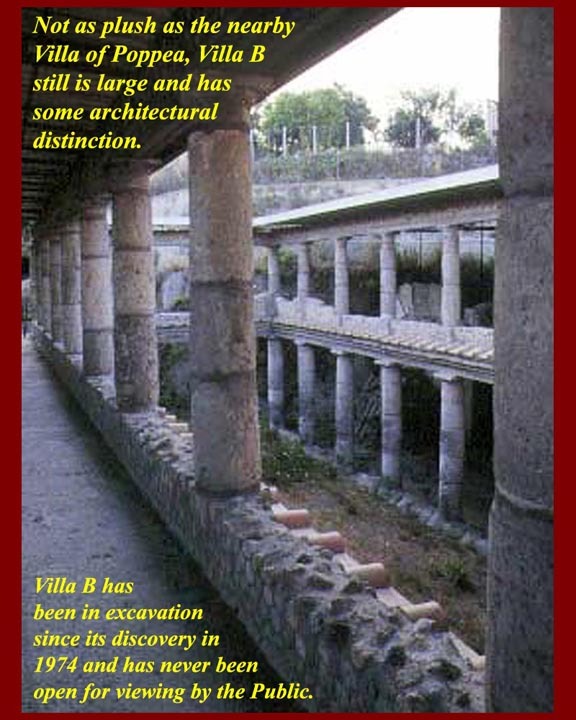 Villa B was not inhabited at the time of the eruption, because it had been converted into a winery. 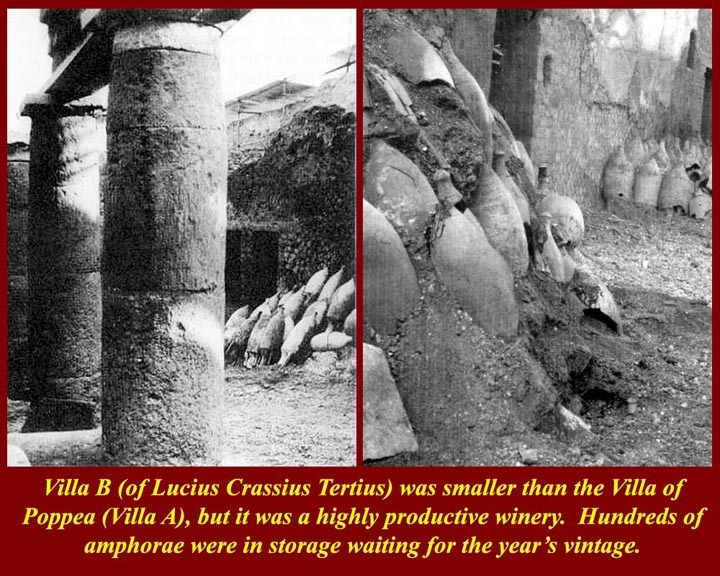 Wine amphorae, already coated on the inside with pine-pitch, were stacked upside down, waiting for the year's vintage. 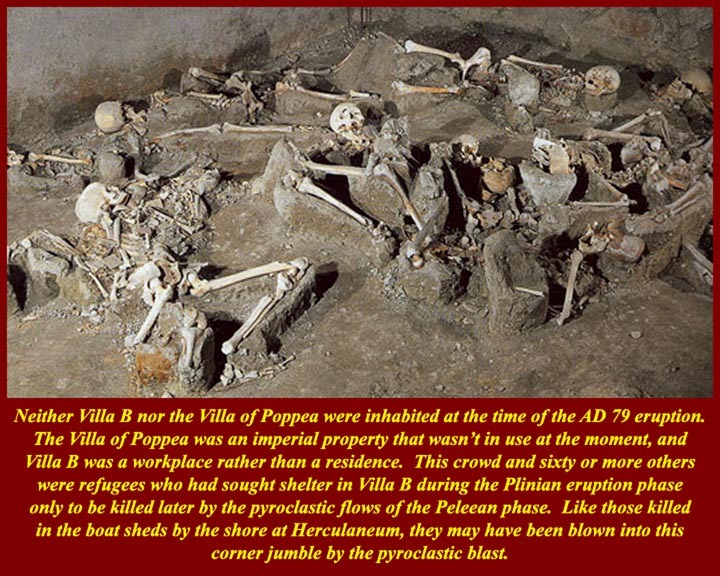 Although no landlord family was present (no furniture in the living quarters) these and sixty or so others took shelter in the villa during the eruption's Plinian phase only to be killed by the pyroclastic flows of the Peleean phase. Like the bodies found in the boat sheds at Herculaneum, these people may have been blasted into this corner by the first surge-flow that hit the villa. 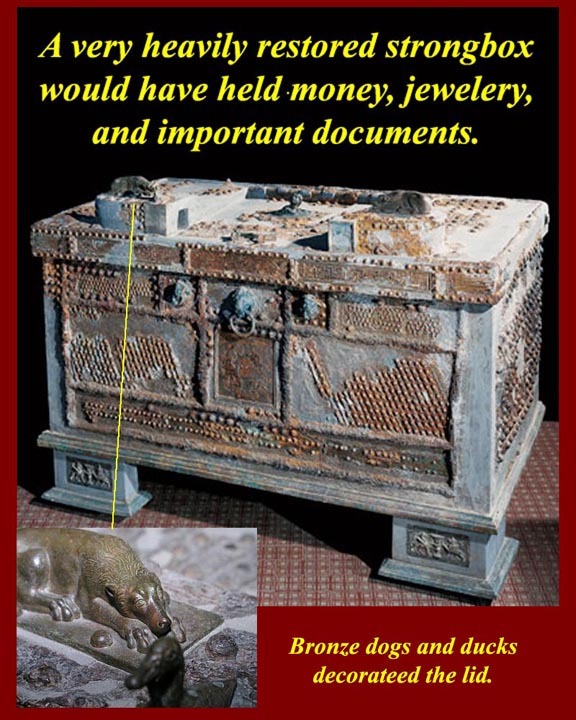 A strongbox of oak, iron, and bronze: it would have held valuables and important papers. 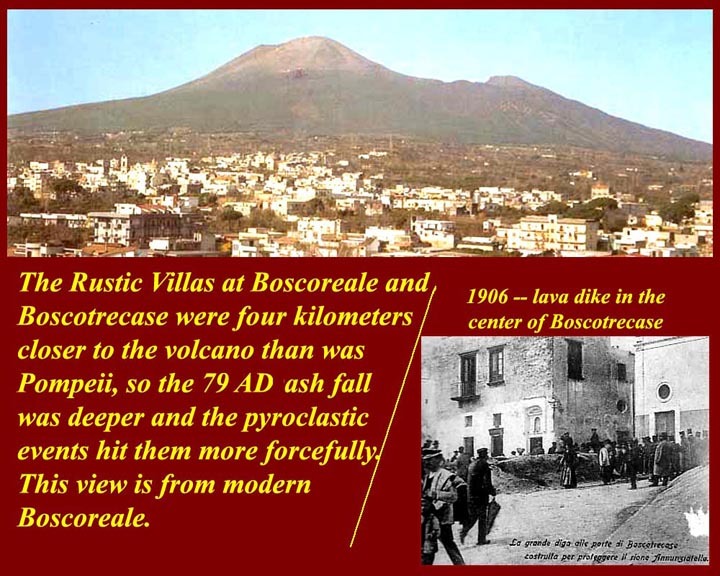 A view of Vesuvius from Boscoreale, a prominence on the slope that held several large Villas. In the lower right corner, one of the dikes built in the town to hold back lava from the nearby town of Boscotrecase durin a 1906 eruption. 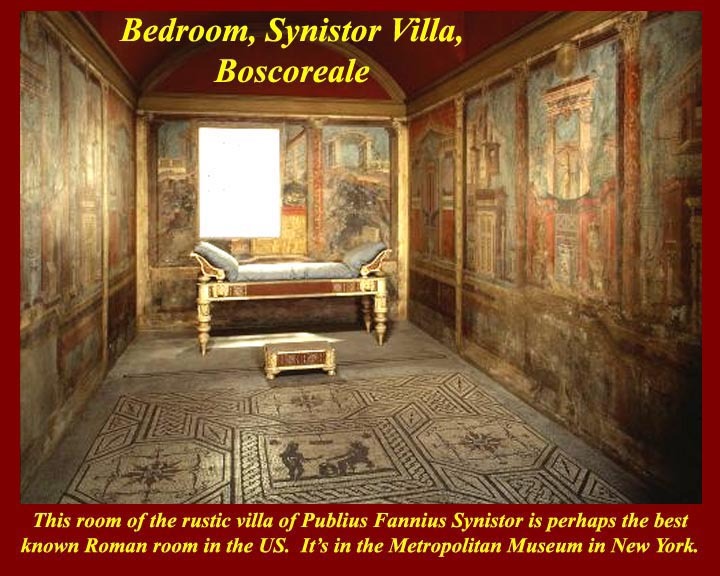 A room from the villa of Lucius Fannius Synistor in Boscoreale, now in the Metropolitan Museum of Art in New york. 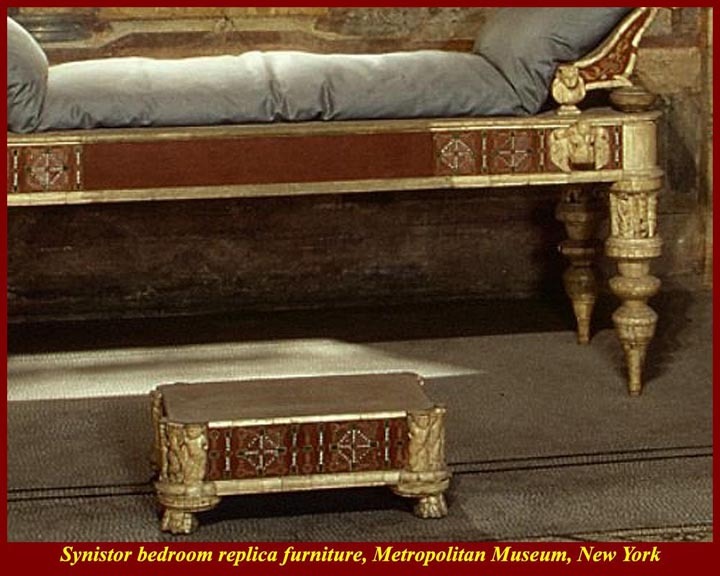 Replica bed and stool from the Synistor bedroom. 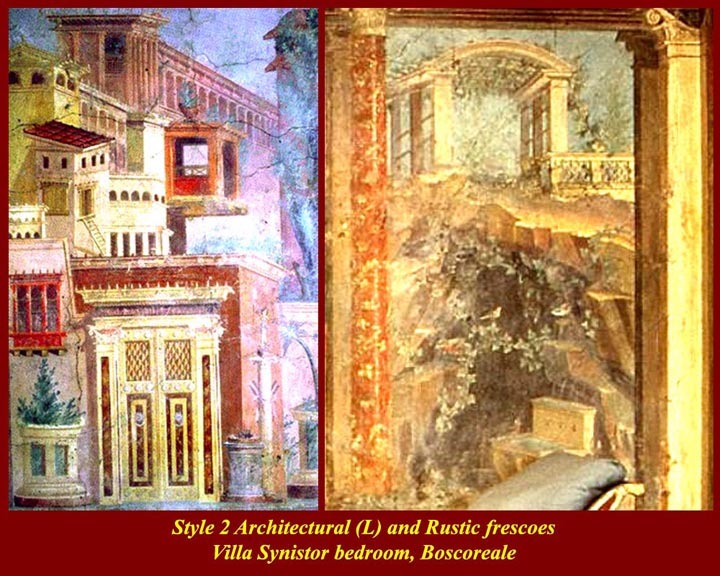 Style 2 architectural and rustic scenes from the Villa Synistor bedroom. 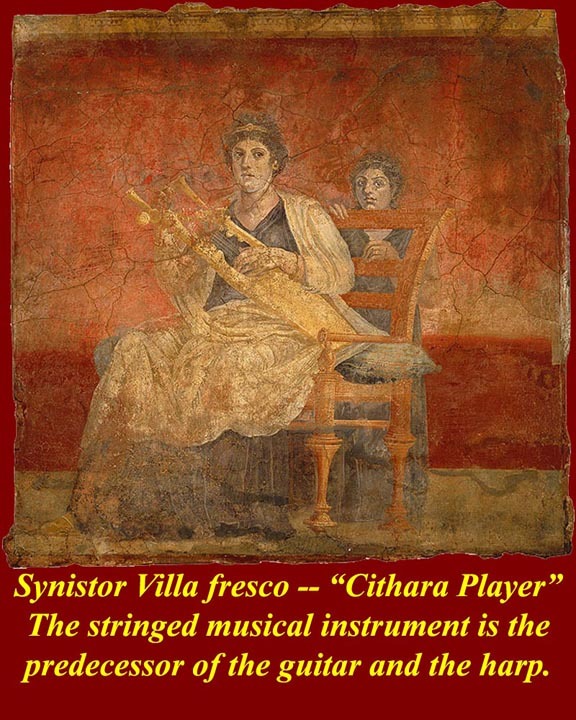 Woman with a cithara, fresco from the Villa Synistor. The stringed cithara was the predecessor of the harp and of the guitar, the latter of which derived its name from cithara. 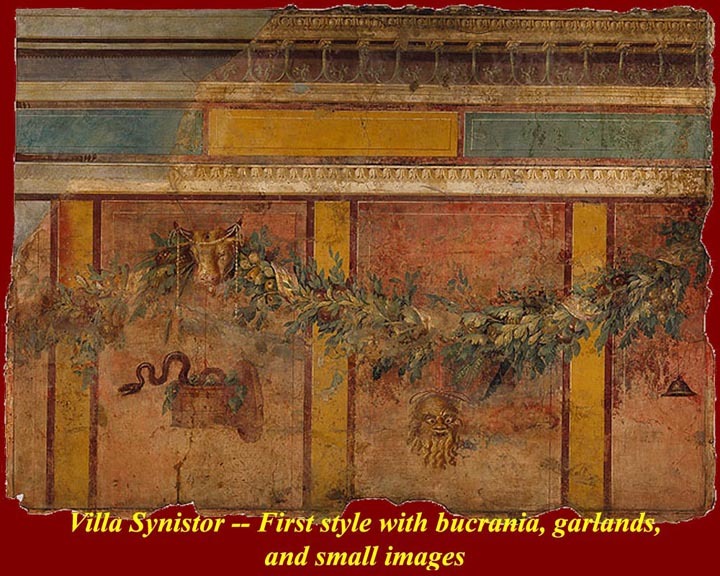 A Villa Synistor first style fresco: garlands, bucrania, and small images on a faux marble background. 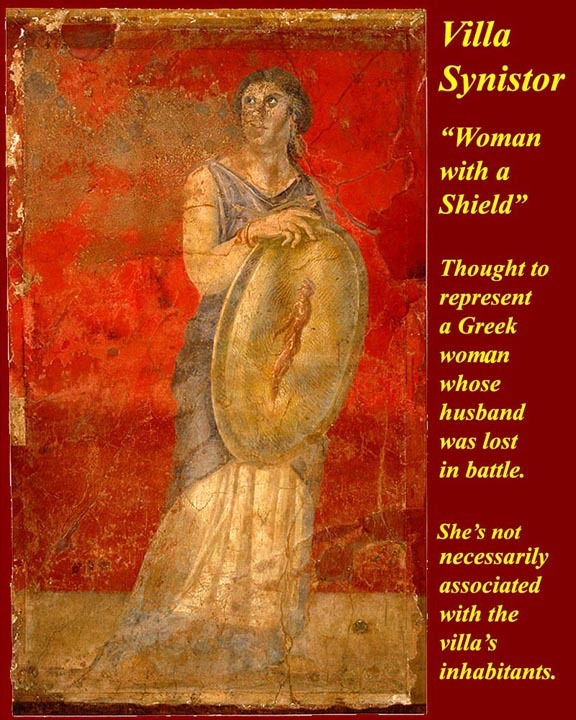 A woman with a shield: Greek woman mourning a husband lost in battle. There is no necessary connection between the image and any of the inhabitants of the house. 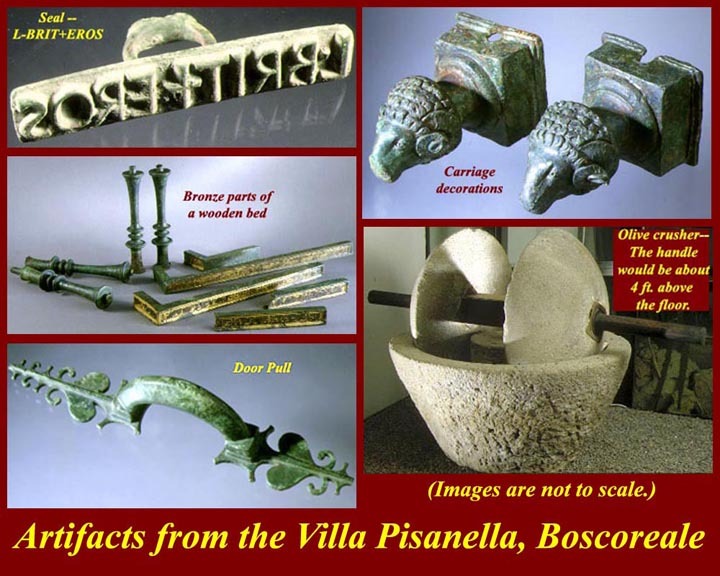 Artifacts from the Villa Pisanella: a name seal, two carriage ornaments, a large olive crusher, a bronze door handle, and bronze fittings for a bed. 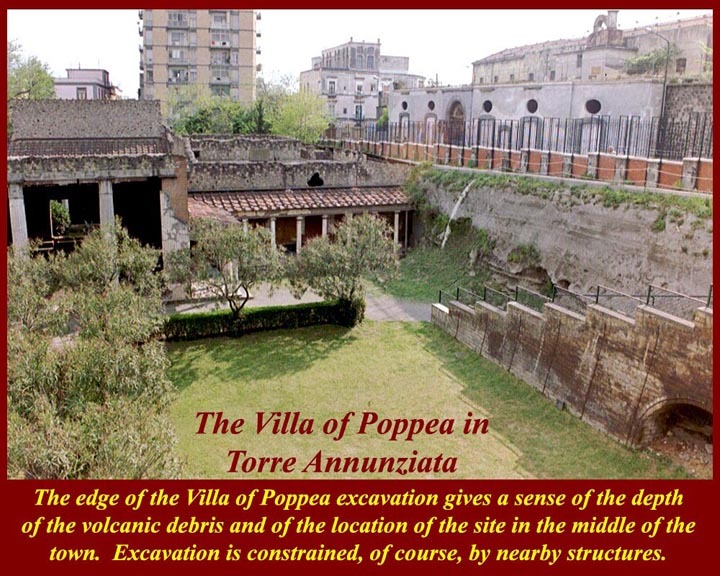 The villa was excavated in the late 1890s and then re-buried. 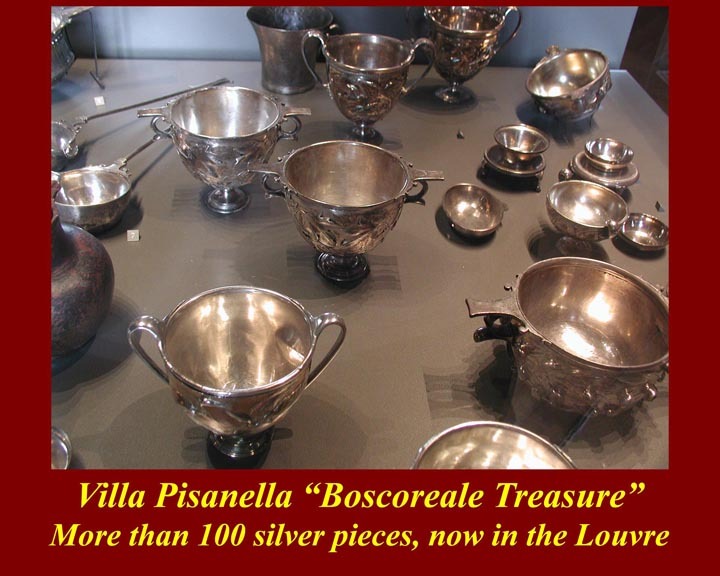 Gold jewelry was found with the silver "Boscoreale treasure" found in the Villa Pisanella. 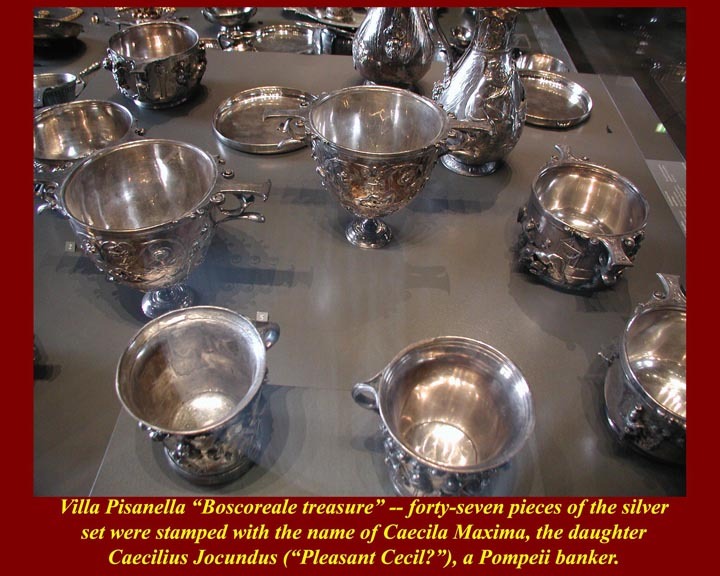 More than one hundred pieces of a serving and eating silver were found at the Villa Pisanella. Most of the pieces are now in the Louvre in Paris. 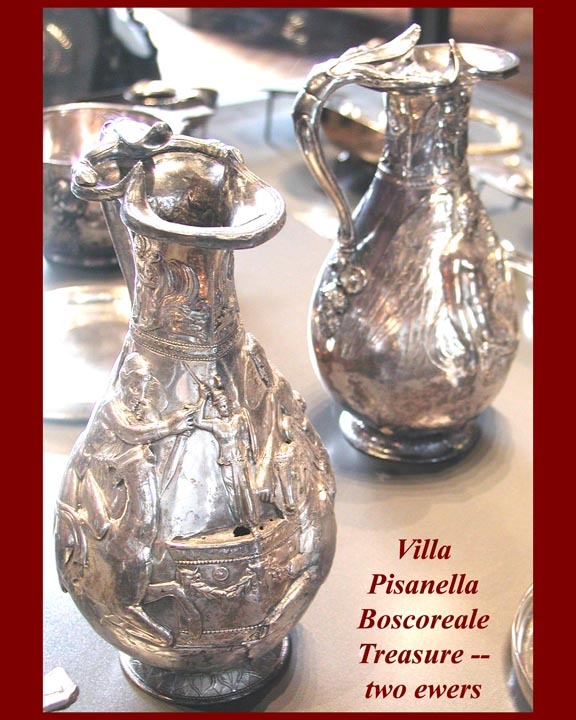 More of the Villa Pisanella Boscoreale silver. 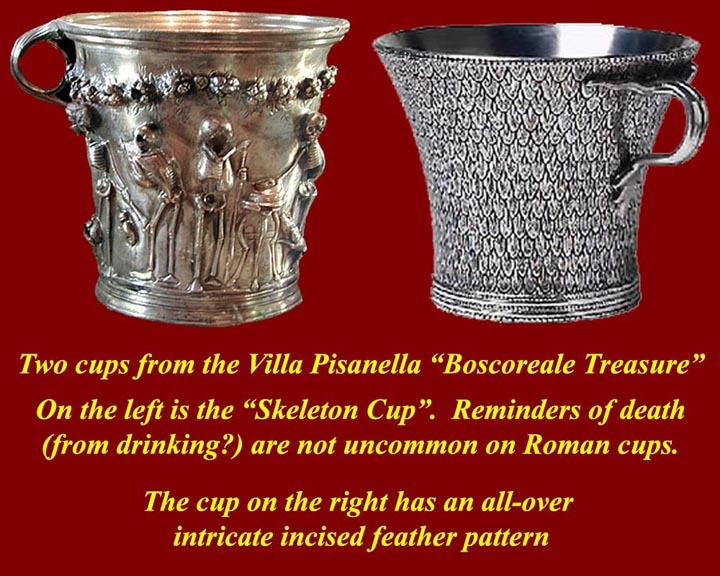 Two cups from the Boscoreale treasure. 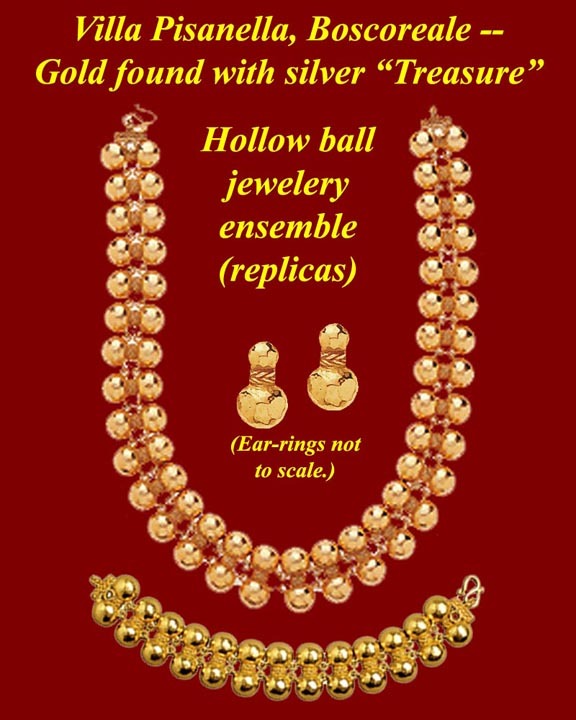 Replicas are available on line from the Louvre store. 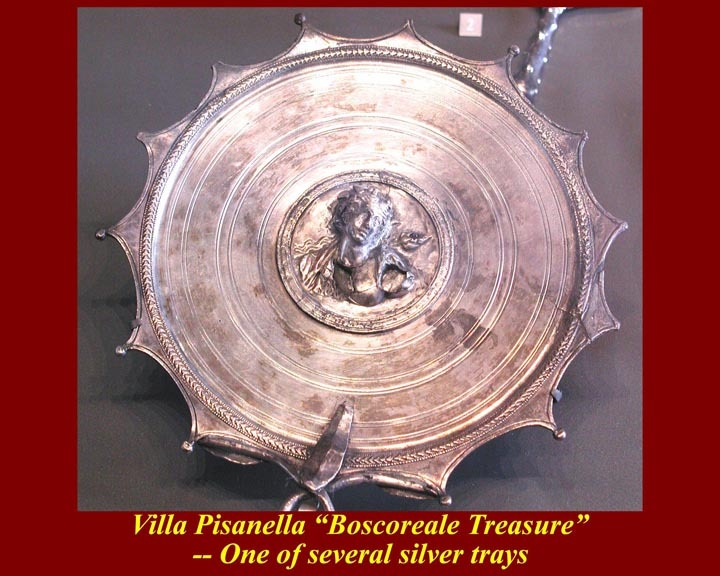 One of several large silver trays from the Boscoreale treasure. 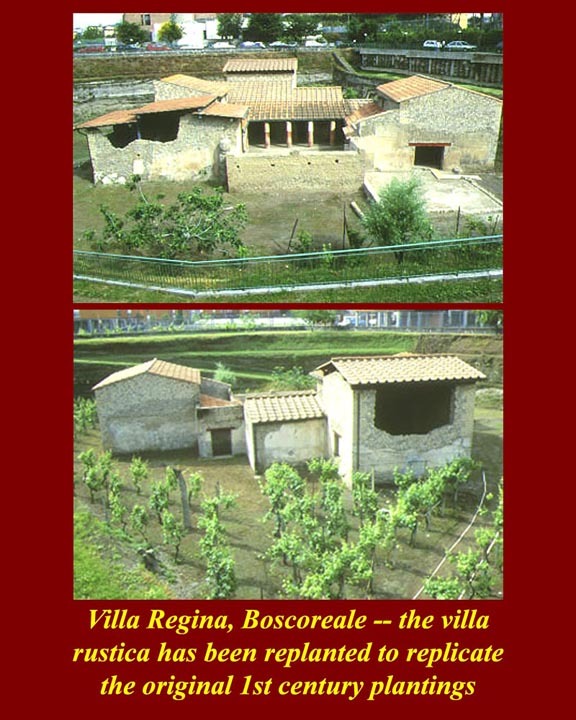 The Villa Regina at Boscoreale was a working farm with no entertainment rooms. It has been restored and replanted as it was before the 79 AD eruption. 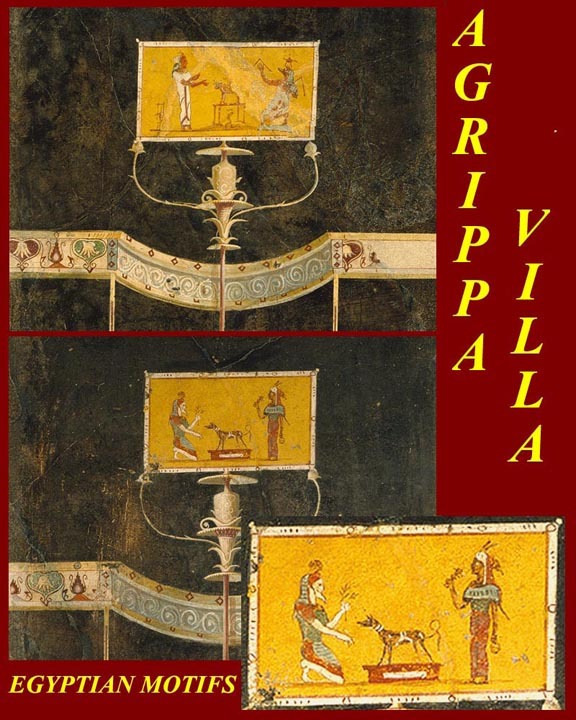 The main product of the Villa Regina was wine. 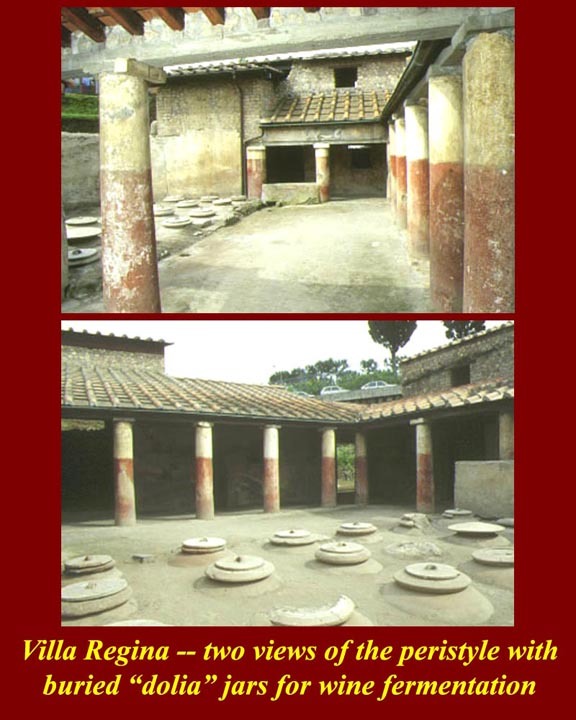 In this image are two views of buried dolia, large jugs in which wine was fermented. 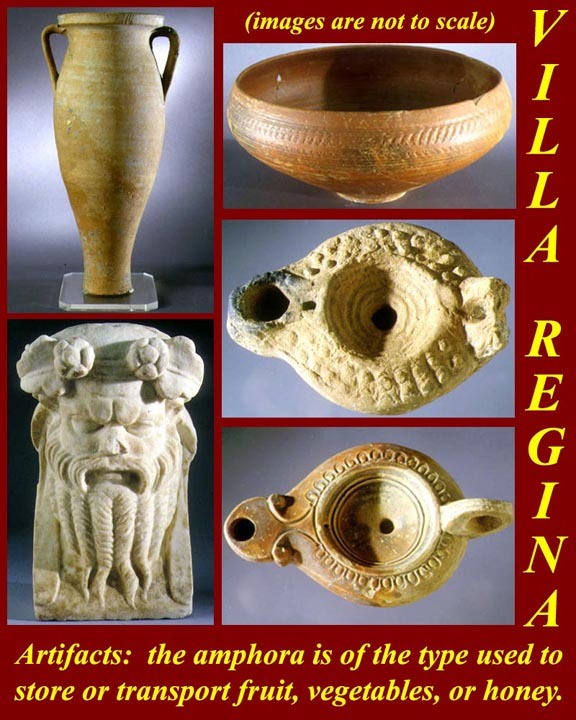 Various artifacts from the Villa Regina. The amphora, upper right, was the type used for storage of honey or fruit. Below it is a Silenus. 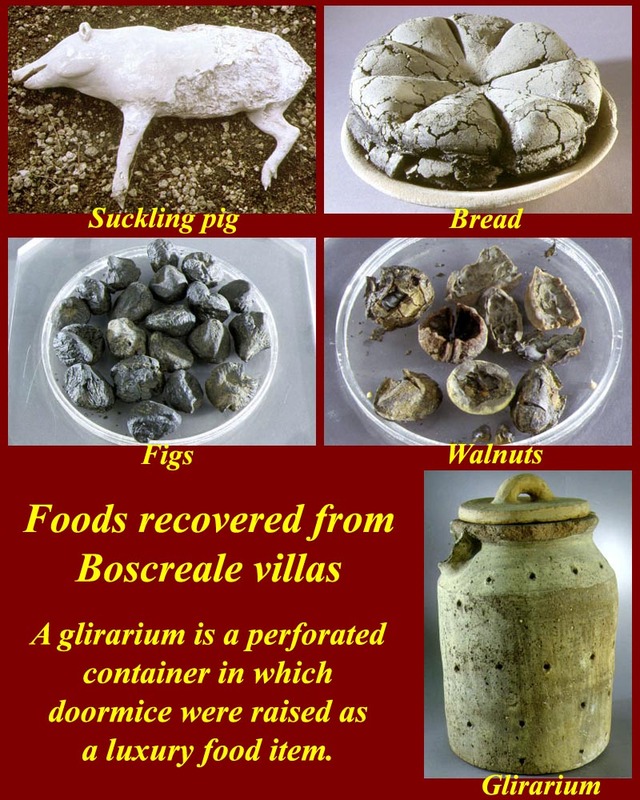 Food items recovered from Boscoreale villas. Bread, figs, and walnuts are carbonized. 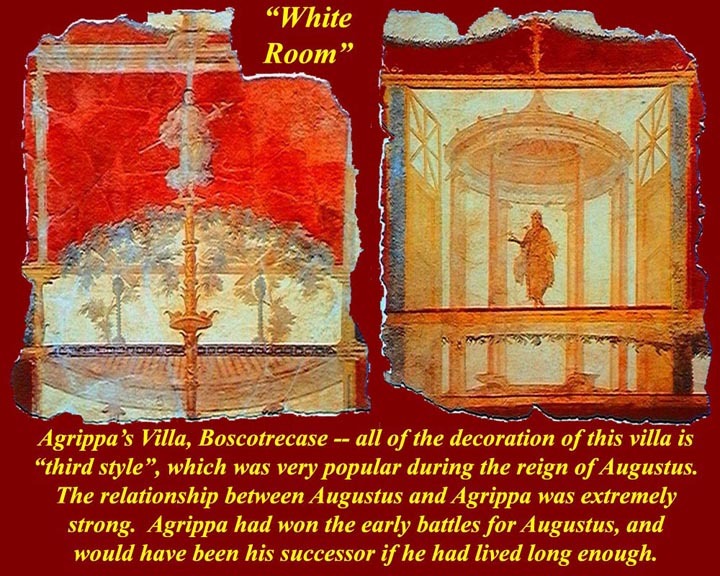 Agrippa's country villa at Boscotrecase was decorated in third style. 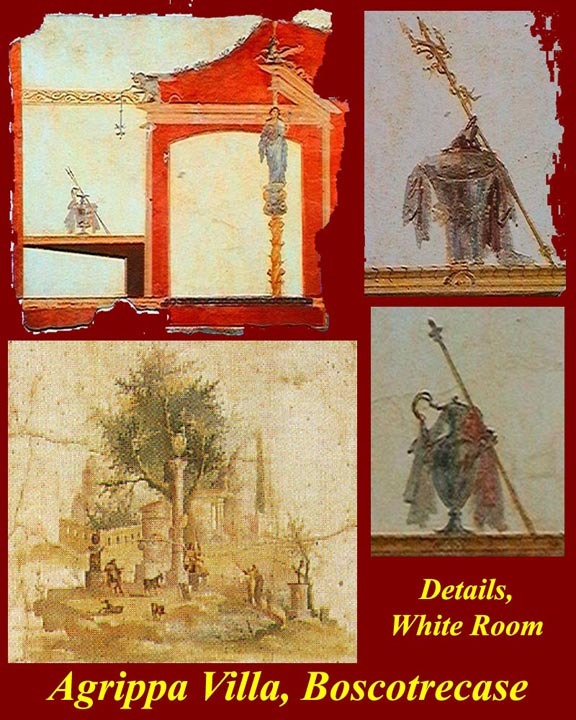 The two most important rooms are now called the Black Room and the White Room. The image shows a single panel from the black room. 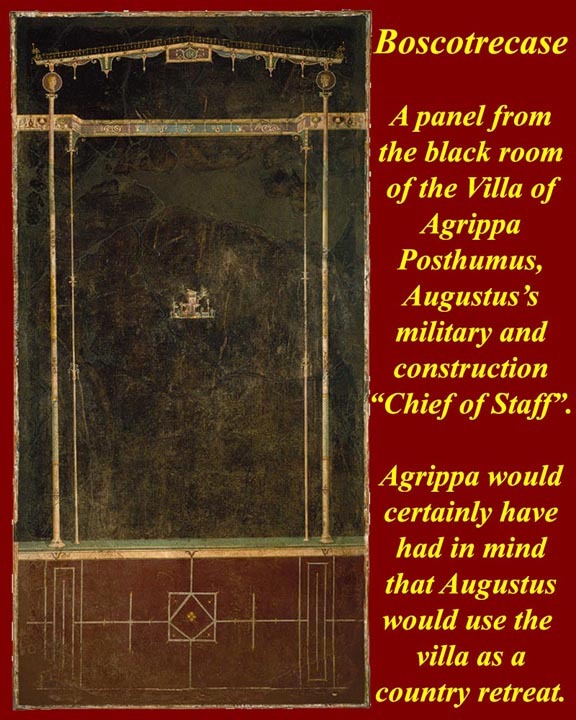 Agrippa probably build the retreat for use by his patron, Caesar Augustus. 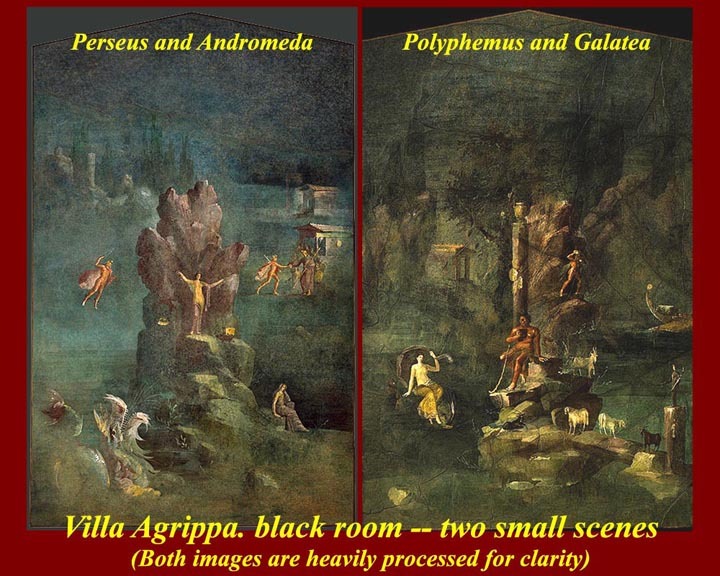 Mythology details -- black room: Perseus and Andromeda / Polyphemus and Galatea. 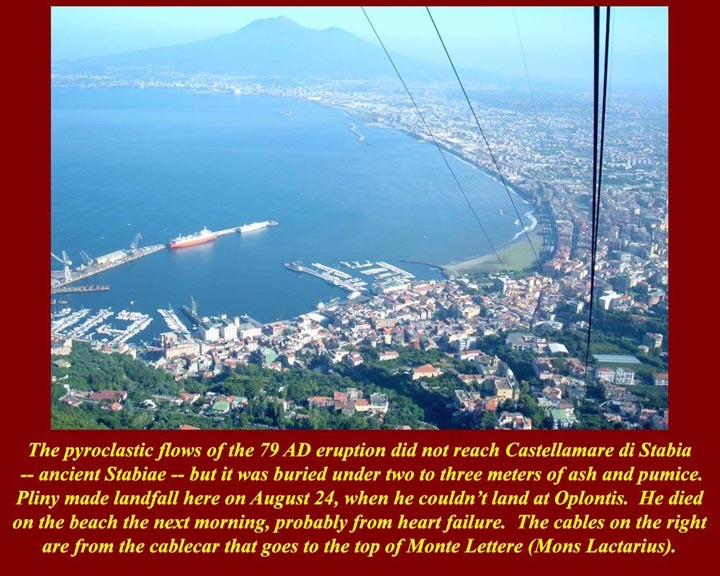 Castellammare di Stabia now stands where ancient Stabiae was laid out along the south eastern end of the Bay of Naples. 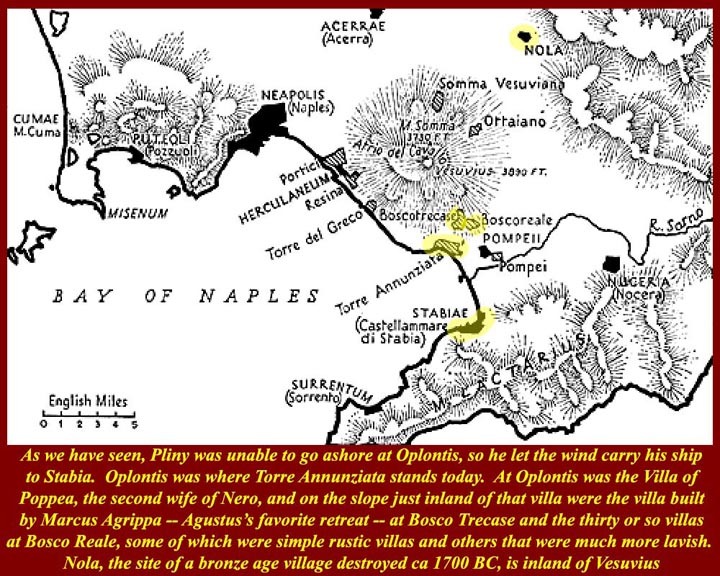 On August 24 of 79 AD Pliny was summoned to rescue the wife of a friend at Oplontis (Torre Annunziata). He was unable to put ashore there because of the accumulation of volcanic debris -- probably floating pumice -- and because the water had receded in early-stage tsunami activity. He went ashore at Stabiae and died there the next morning, probably of heart failure. 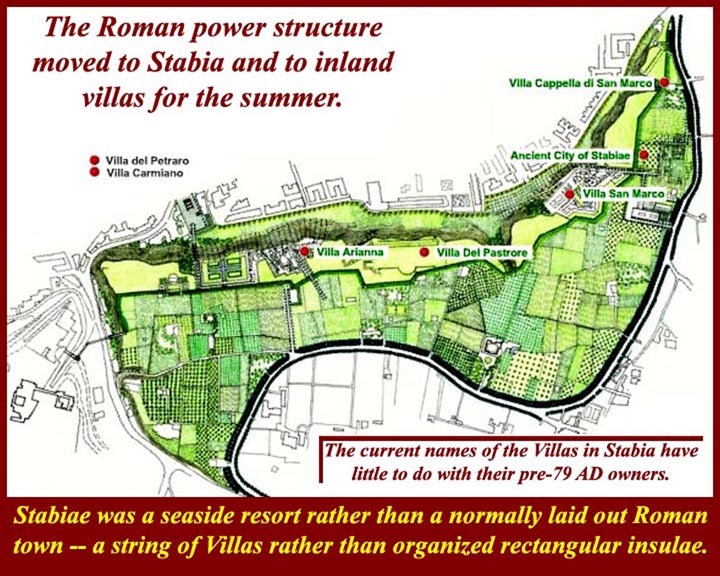 A modern internet tourist map of the villas at Stabiae: The map shows only the few that were excavated, but they probably were strung like pearls, side by side along a low cliff that was separated from the shore by a narrow beach. The shoreline is now more than a mile from the ruins, mostly as a result of volcanic deposits. The Pyroclastic flows stopped short of Stabiae but it was in the path of the Plinian ashfalls. 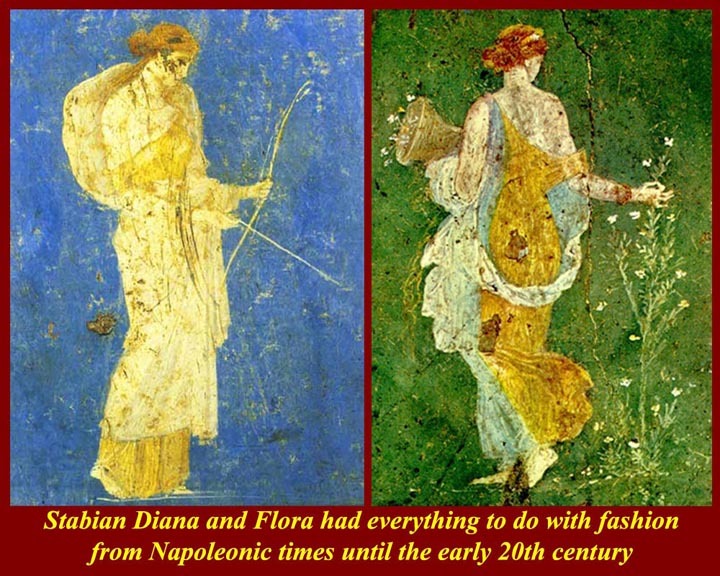 Stabiae's two famous fashion plates inspired 18th, 19th, and 20th century designers of women's clothing. 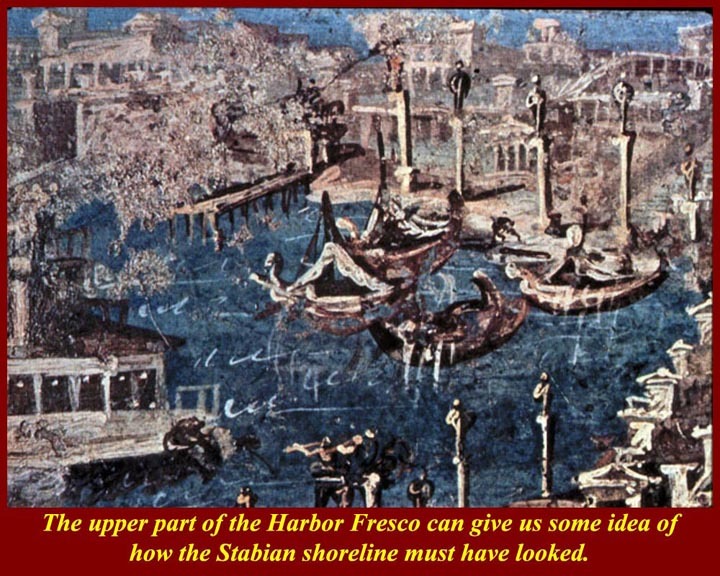 A fresco from one of the Stabian villas shows the harbor. 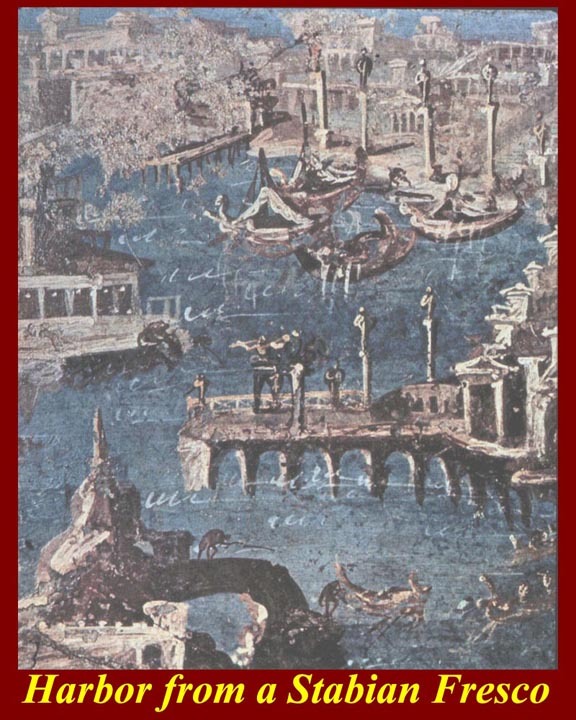 A closer view of the upper part of the same fresco gives an idea of what the Villas looked like along the shore. From the Villa Pastore (Villa of the Shepherd) comes this non-Christian image of the "Good Shepherd". 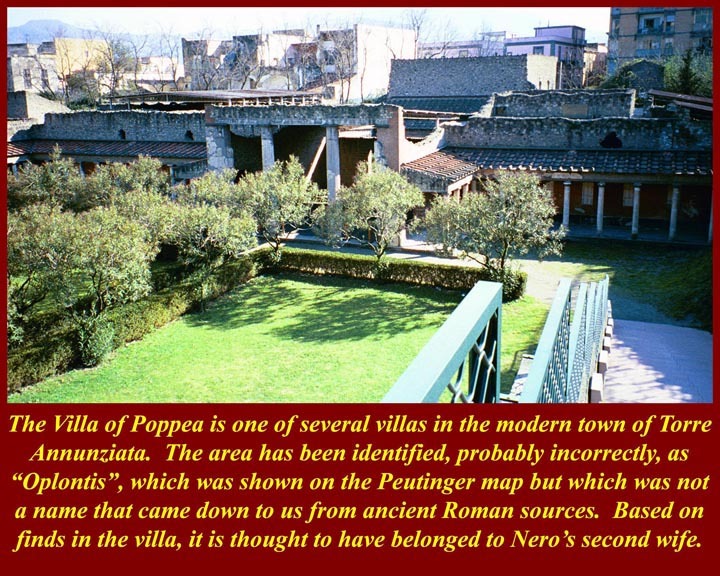 The villa appears to have built in two phases on different axes. 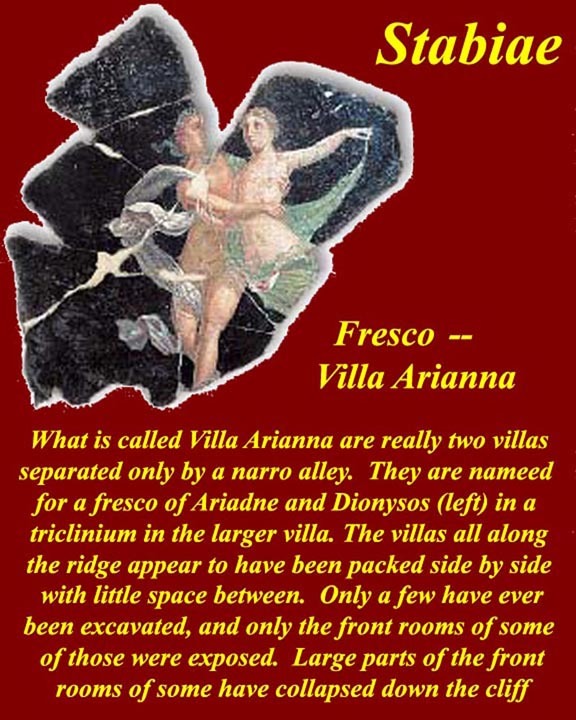 What is now identified as the Villa Arianna is actually 2 adjacent villas. In the larger of the two is a fresco of Dionysus and Ariadne, shown here. 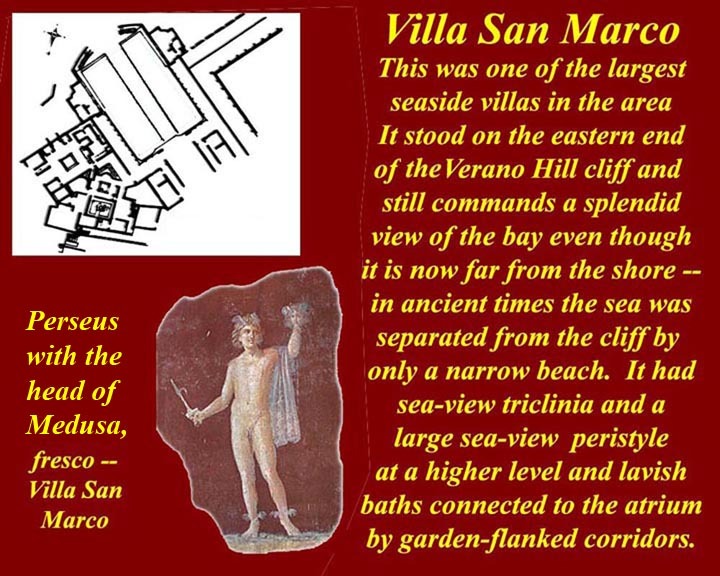 The Villa San Marco is at the end of the string of pearls at the eastern end of the low cliff. 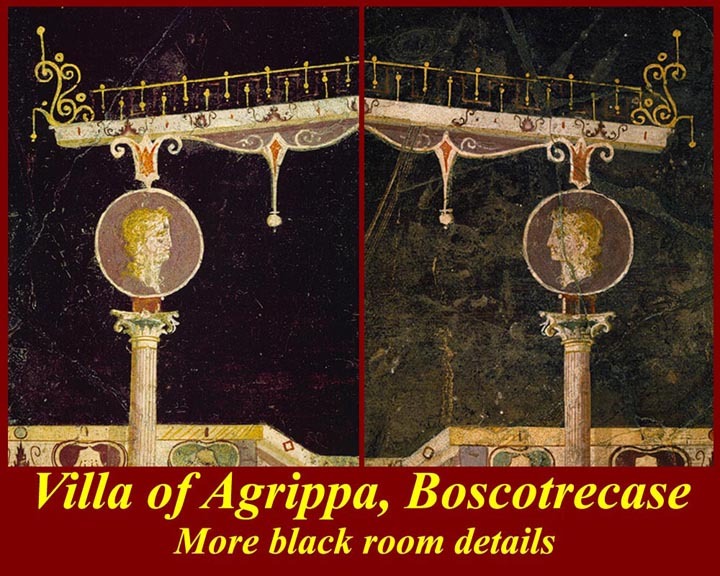 The fresco has been identified as Mercury, but it is clearly Perseus with the head of Medusa.